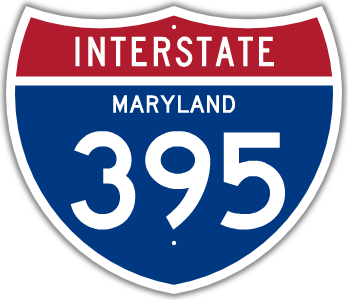 A fitting entrance into downtown Baltimore, I-395 begins with the elevated interchange with I-95 over the Middle Branch of the Patapsco River. After entering I-395, there's only two choices-you can split off around the west of downtown on Martin Luther King Blvd. or head straight where I-395 quickly ends in front of Oriole Park at Camden Yards, but not before an at-grade intersection at Conway St. Howard St. continues ahead, sharing right-of-way with the Light Rail line north through the downtown area. On the way out, it's a similar affair, the last chance to stay downtown is at Camden St. Most of the lanes lead to I-95 southbound, and only one for the somewhat narrow sky ramp for I-95 north. It can be a bit harrowing if one is fearful of heights, but provides a nice view nonetheless. 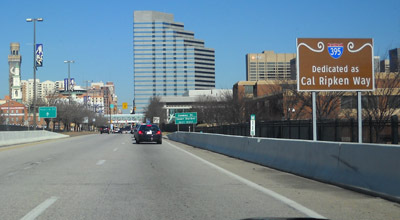 One of the state's traffic cameras is mounted at the top of the ramp to view I-95 below.